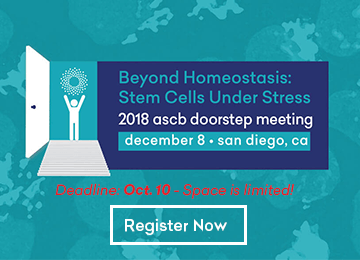 This year will mark the second joint ASCB|EMBO meeting and the 58th annual ASCB meeting, which is being held in my new hometown, beautiful, sunny San Diego, CA! The beaches and weather are as perfect in December as they are in July. (Although, if we get some rain while you are here, my apologies, but we need it!) We are expecting over 6,000 people from all over the world to attend the 2018 ASCB|EMBO Meeting. Come join us! In writing this piece I thought I’d first reflect on my own experiences of attending ASCB meetings. My first ASCB meeting was in San Francisco in 1996 when I was a second-year graduate student in the Cell Biology Department at Yale University. Not only was it my first time in San Francisco, but it was my first major scientific meeting. I was blown away by the breadth and excitement of the meeting. Since that time, I’ve attended nearly every ASCB meeting. An early meeting that had a big impact on me was the 1997 meeting, when I remember hearing Eva Nogales, who is the incoming ASCB President-Elect, talk about the structure of tubulin to a standing-room-only crowd. This sense of excitement has continued through the many ASCB meetings I have attended and participated in since then. Each year I look forward to learning about new science, meeting old friends and colleagues, meeting newcomers to my field, and participating in the wealth of programming that focuses on career development and science policy. I planned this year’s program with my EMBO co-chair Thomas Langer, ASCB President Jodi Nunnari, and a fantastic Program Committee. 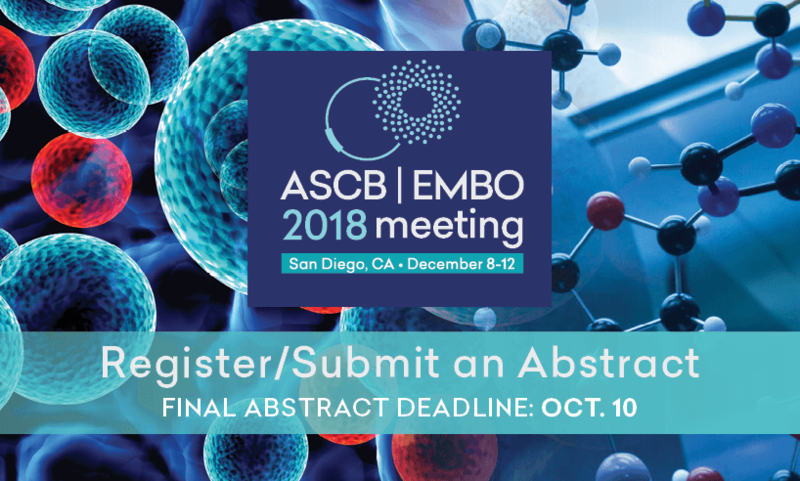 Over the years ASCB, now working in partnership with EMBO, has strived to lead the way in modern cell biology at its Annual Meeting. This meeting is very much a reflection of that. An early meeting that had a big impact on me was the 1997 meeting, when I remember hearing Eva Nogales…talk about the structure of tubulin to a standing-room-only crowd. For the third year in a row there will be an ASCB Doorstep Meeting prior to the main meeting. Past Doorstep Meetings focused on the cell biology of cancer (2016) and the cell biology of brain development, function, and degeneration (2017). This year’s Doorstep Meeting was organized by Elaine Fuchs (Rockefeller University and HHMI) and Sean Morrison (University of Texas Southwestern Medical Center and HHMI) and is titled “Beyond Homeostasis: Stem Cells Under Stress.” The meeting will take place on Saturday and culminate in the ASCB|EMBO Keynote Lecture by Sean Morrison, titled “Niches for Stem Cells in Bone Marrow,” which is open to all. The 23 Minisymposia and 18 Microsymposia seek to cover the entire gamut of scientific interests of the ASCB|EMBO community. In addition to the doorstep meeting, Saturday also features what has become one of the highlights of ASCB|EMBO meetings, the member-organized Special Interest Subgroups. 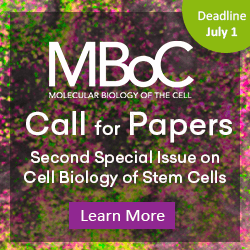 This is a mechanism for all ASCB|EMBO members to apply to organize a meeting session on an emerging topic in cell biology. This year there will be 26 subgroup sessions, on Saturday and at other times throughout the meeting. For example, Jennifer Lippincott-Schwartz (Janelia Research Campus and HHMI) and Thoru Pederson (University of Massachusetts Medical School) will run a subgroup on “Physics and the Cell: 2018 and Beyond” to highlight a major frontier in cell biology. Bob Goldstein (University of North Carolina, Chapel Hill) and Mansi Srivastava (Harvard University) will chair the subgroup on “Emerging Model Systems,” which has become an important new area in modern cell biology as techniques that have been developed in traditional model systems are being applied to organisms that were previously less tractable. This year’s meeting features eight Symposia topics that also focus on the forefront of modern cell biology: Nuclear Organization, Cell Migration, Neuronal Cell Biology, Cytoskeletal Dynamics, Metabolism, Regeneration and Morphogenesis, Organelle Communication, and Quality Control. The 23 Minisymposia and 18 Microsymposia seek to cover the entire gamut of scientific interests of the ASCB|EMBO community. Award for Excellence in Science Education to Erin Dolan (University of Georgia), the E.B. Wilson Award to Barbara Meyer (University of California, Berkeley, and HHMI), the Porter Lecturer to Ruth Lehmann (Skirball Institute, New York University School of Medicine and HHMI), the Porter Prizes for Research Excellence to Andrew Moore (HHMI Janelia Research Campus) and Melanie White (A*STAR), the EMBO Gold Medal to Marek Basler (Biozentrum at the University of Basel, Switzerland) and Melina Schuh (Max Planck Institute for Biophysical Chemistry in Göttingen, Germany), the Jeantet Prize Lectures to Christer Betsholtz (Karolinska Institute, and Uppsala University, Sweden) and Antonio Lanzavecchia (Institute for Research in Biomedicine and Università della Svizzera italiana, Switzerland), and the WICB awards (see p.51). There will be three scientific workshops at the meeting, the goal of which is to provide in-depth technical insights on emerging techniques and tools for modern cell biology. This year will feature “New Fluorescent Probes and High-Throughput Imaging Approaches” organized by Brenda Andrews (University of Toronto) and Luke Lavis (Janelia and HHMI), “Screening Approaches in Human Cells and CRISPR Methods” organized by Manuel Leonetti (Chan Zuckerberg Biohub) and Martin Kampmann (University of California, San Francisco), and “Electron Cryo-Tomography and Correlated Light and Electron Microscopy (CLEM)” organized by Wanda Kukulski (MRC Laboratory of Molecular Biology) and Martin Pilhofer (ETH Zurich). The ASCB and EMBO have been leaders in career enhancement programming for decades. Of special note this year there will be two career enhancement programming theaters in the Learning Center (exhibit hall) with programs running throughout each day of the meeting. There are events for every career level, with topics including career options for cell biologists, how to thrive as a new faculty member, excelling in your current role, and understanding the National Institutes of Health (NIH) grant review process. In today’s political climate, it is more important than ever that scientists be able to articulate the value of their work to the public. Learn how to do this at the public policy sessions offered at the meeting, including “Advocacy Toolbox I: The Two-Minute Speech” and “Advocacy Toolbox II: Practice Being an Advocate for Science.” Those who are really inspired by advocacy should consider the session on Careers in Science Policy. [T]hree scientific workshops [will] provide in-depth technical insights on emerging techniques and tools for modern cell biology. ASCB, in partnership with the 4D Nucleome group funded by the NIH Common Fund, will run a full-day meeting on the Friday before the ASCB|EMBO meeting begins. The goals of this group are to develop and apply approaches to map chromatin structure and dynamics. The meeting will highlight progress toward these goals. Also on Friday, ASCB, in partnership with the Keck Graduate Institute, will sponsor the “Biotech Mini-Course,” a daylong course for graduate students and postdoctoral fellows aimed at helping basic scientists be competitive for jobs in the biotechnology and pharmaceutical sectors. This successful course, as well as the longer summer version of the biotech course, has now been running for five years. On behalf of myself and my co-chair Thomas Langer, we look forward to seeing you in San Diego in December! 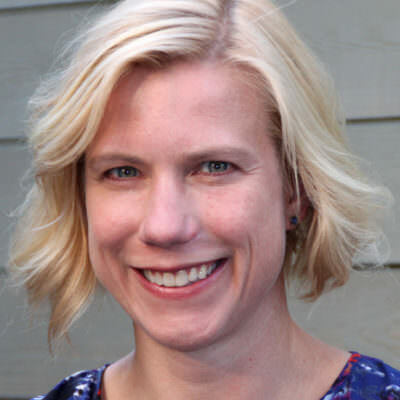 Samara Reck-Peterson, University of California, San Diego, and HHMI, is co-chair of the Program Committee for the 2018 ASCB|EMBO Meeting.